In a nutshell: Random generosity makes you happier, it makes you even happier if you register the impact in person. I’m a big fan of Coursera and last year I found a course called ‘A Life of Happiness and Fulfillment’. It’s taught by Dr. Rajagopal Raghunathan from the Indian School of Business and it’s based on mountains of research and years of investigation into what makes people happier. It is not at all woo woo! The course is set out into topics and assignments and one of them is ‘Creative Altruism’. The idea is that you design a random act of generosity with a contained cost, that doesn’t overwhelm yourself your or resources, that is fun for both parties and, most importantly that you register the effect of your generosity,. When I did the assignment I spent a tenner on things I thought would be useful for homeless people – we have little pockets of tent dwellers in our city so I bought tarpaulins, thermal socks and those instant warmer things to give away. It was pretty nerve wracking approaching someone who I thought was needy enough, what if they were drug users, what if someone else was needier, what if I was being patronising. I ended up deciding to give to the first person I saw. The first person was a drug addict who grunted as I gave him my carefully chosen pair of socks, I felt dispirited. The second person was a tent dweller trying to rain proof his tent and I know that the tarp came in very handy for him. I kept doing this until the tenner had run out and I mostly got really good responses. Despite the best of intentions, I forgot all about creative altrusim until this story came up on the Moth Radio Hour. In case the link ever breaks, it is by Ashok Ramasubramanian who talks about the joys of sharing. I can’t tell you any more or I’ll ruin it for you! The story is called Joy. This made me think about what I have in my declutter box that could be useful for others and I decided to carry around the book I have just finished in case I meet someone who might like it. The first person I saw begging in an underpass greeted my ‘could you use a book?’ question with a look of relief; I’d treated them like a human, it hadn’t cost me anything and it made both of us happy. So, why not try giving something directly insead of via a charity shop? I learned that you need to be humble to get the most out of it, I also learned not to expect gratitude from the other person, to go into it with an open attitude and don’t let it hurt you if your efforts are negated. 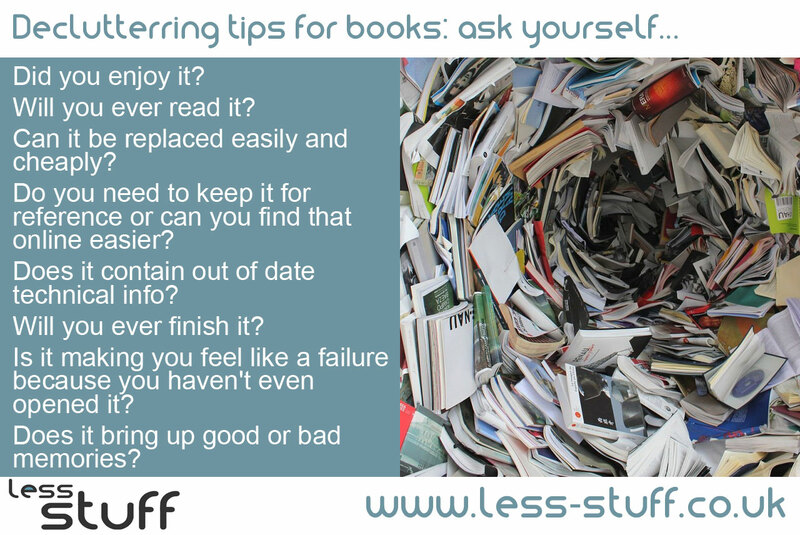 I’m decluttering my books this way now, and it works well with a one book in, one book out rule. If you want to know more about the Life of Happiness course, it is free and on Coursera, and here.